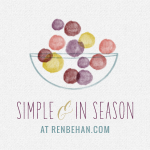 One of the reasons why Louisa and I created the blogging challenge – Four Seasons Food - was because we both enjoy eating seasonally and find the diverse dishes that you naturally lean towards making depending on the time of year intriguing. A joy of Spring for me is that I once again start to crave salads. I am definitely a girl who veers on the savoury side of life and I love eating the kind of fresh, lighter meals that Spring and Summer inspire. Don’t get me wrong, I can scarf down a hearty beef stew or a rich shepherds pie with the best of them and feel wholly fulfilled and comforted. But I also relish the simplicity of lettuce with a well made vinaigrette. I am pretty sure I have said this before but salads are not boring. Or at least they don’t have to be. With a little imagination, they can be quite fancy, full of big flavours and exceptional textures. Possibilities of salty, sweet, crunchy and creamy, they can just about tick every box on your tastebuds! So for me to truly celebrate Spring, I knew I had to create a salad to mark my transition into this type of eating. But not just any salad – something that looks as good as it tastes, a seductive salad if you will ! And so, I poached a little chicken, I knocked up some home made mayonnaise, I squashed some avocados, I grated some giant radish and some carrot, I chopped some coriander, I whisked up a little lime and chilli dressing and layered it all in a ring. And I was pretty darn chuffed with the results! It had texture, zing, creaminess and heat. A well balanced combination of contrasts if you can have such a thing! This is a salad for salad lovers and even salad haters – It has something for everyone. Layering your salads is the way forward. You can see all the elements distinctly whilst getting every single one of them onto your fork at once. You really can’t argue with the logic of that! Start by poaching your chicken breasts. 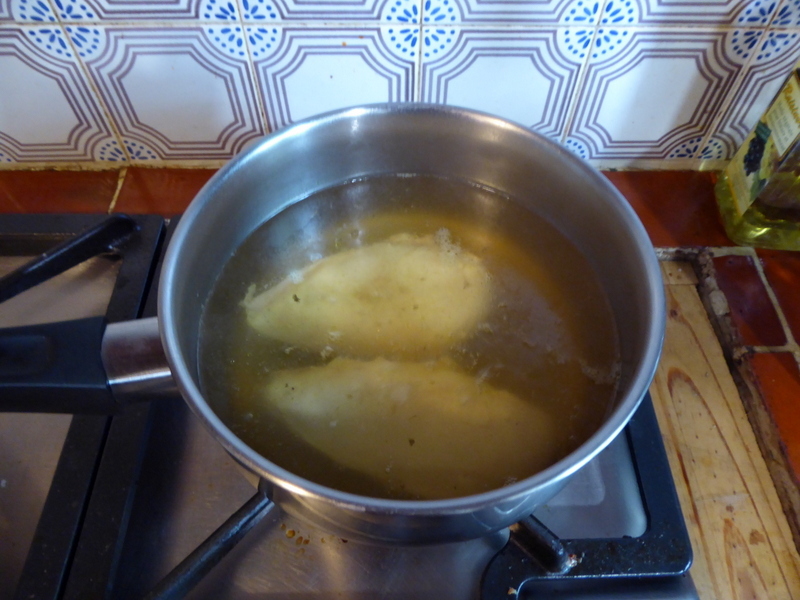 Bring enough water to cover them to boil in a saucepan, add your chicken stock cube if using and place the breasts in the pan and poach for 20 minutes. Then remove and set aside to cool down. Break them up a bit to speed up the cooling if you like. Next, make the mayonnaise. Place the egg yolk in a bowl, add the mustard and season well with salt and pepper. Whisk these together and then slowly drizzle in the oil, whisking continuously until you achieve a lovely yellow, thick mayonnaise. Adjust seasoning and set aside. Next prepare the grated carrot and radish. In a small bowl, place the juice of the lime with the chilli paste and olive oil, season and whisk up to make a spicy dressing. 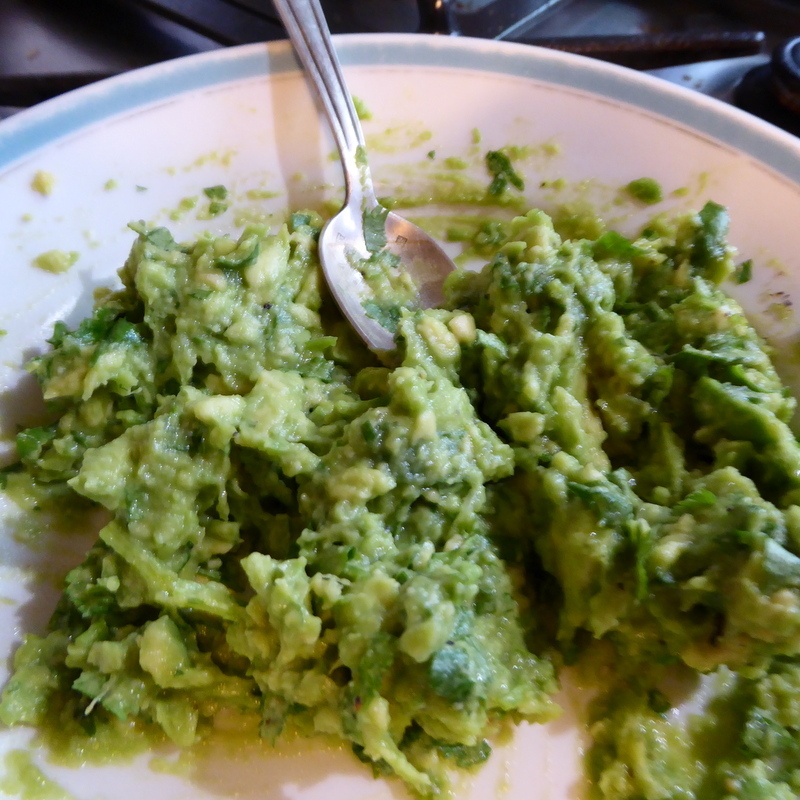 In another small bowl, scoop out the flesh from 1 & 1/2 avocados and fork it to squish. Squeeze in the juice of 1/2 a lime, season and stir in the shopped coriander. Set aside. In yet another bowl, dress your mache lettuce with 2 tbsp of your chilli lime dressing. 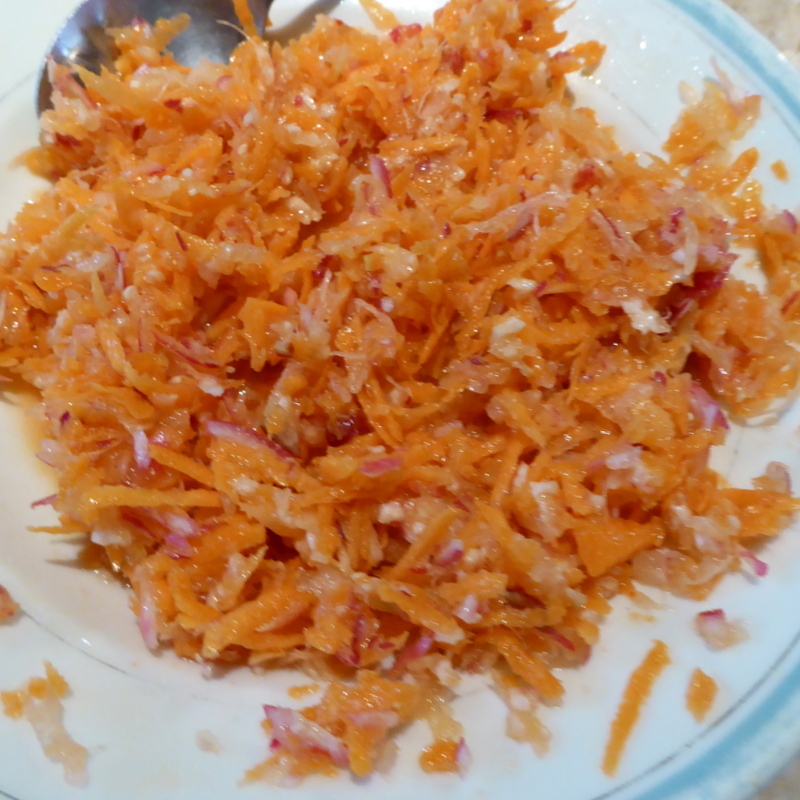 Pour the rest of the dressing in to your grated carrot & radish and mix. Season. Finally, when your chicken has cooled, shred with a fork and stir into your mayonnaise. You are now ready to start layering. Begin with a layer of the lettuce. Top with all of the grated carrot & radish. Then the chicken mayonnaise. Then the avocado. And then the last of the mache lettuce. Finally, slice the left over 1/2 an avocado into slices and garnish the top. Remove the rings carefully and serve. I am entering this recipe into a few blogging challenges. Firstly, Four Seasons Food as this dish is my celebration of Spring! 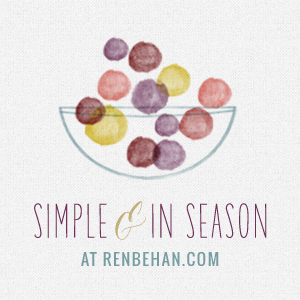 Hosted by Louisa this month over on Eat Your Veg and myself on alternate months. Also, I am entering this into Simple & In Season hosted by Ren Behan as this contains my giant radish and also carrots and coriander. 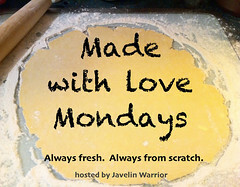 And also into Javelin Warrior’s Made With Love Mondays as this dish was made from scratch. 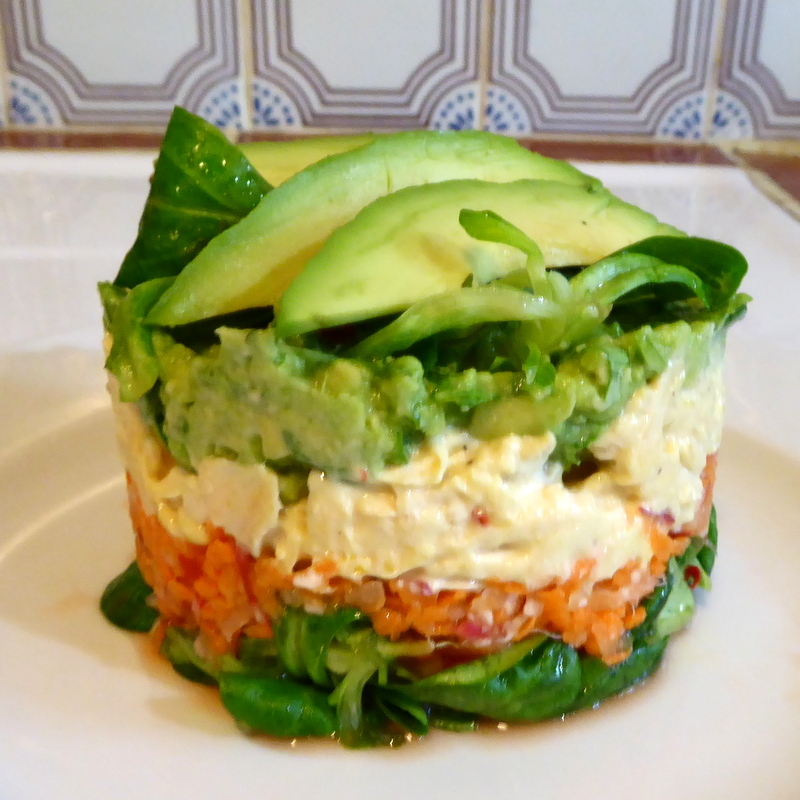 12 Comments on "Layered Chicken & Avocado Salad with Lime & Coriander"
A beautiful salad! I love your presentation! Lovely combination of flavours. Definitely my kind of salad. 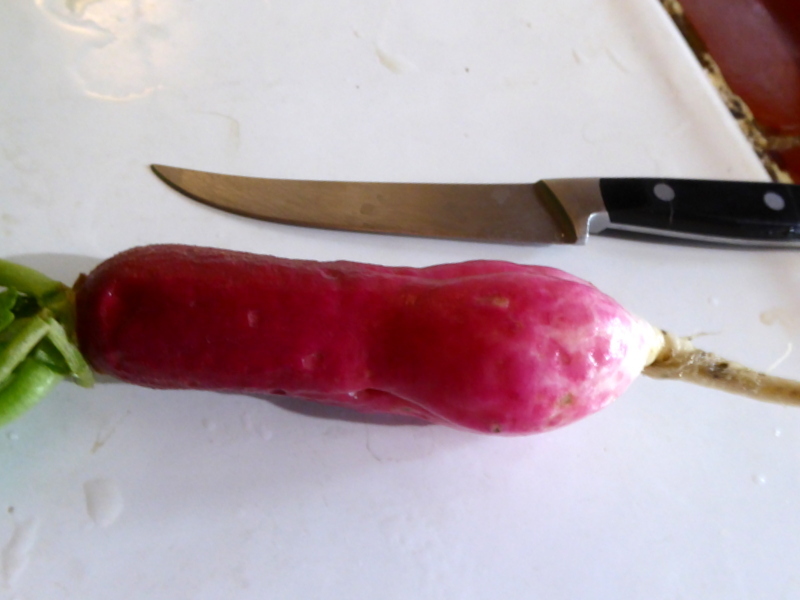 That’s a truly large and impressive radish, by the way. It’s funny how a layered salad is infinitely more enticing than just spread out on a plate. Looks beautiful Anneli as do the ingredients going on in there, an exhilarating combination of textures and flavours. Yummy! And certainly the perfect salad to ‘Celebrate Spring’. I love the look of this salad though – very pretty with all the layers. Guess what? I’m in Paris now until September (studying at Le Cordon Bleu). This salad has a nice Asian twist, with the lime and coriander- so refreshing! That radish has got to be a record-breaker. Love the colours in your salad- thanks so much for sharing! I haven’t noticed this salad earlier, seems very delicious!